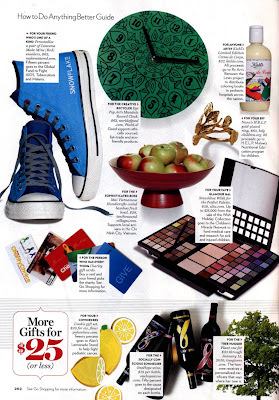 Eye Pop Art in Glamour Magazine! "For the Creative Recycler- Eye Pop Art's Mandala Record Clock, $62, WorldofGood.com. World of Good supports ethically sourced, fair trade, and eco-friendly products." -From "How to Do Anything Better Guide - 25 Amazing Gifts that Also Give Back!," page 282 in December 2009 issue of Glamour. 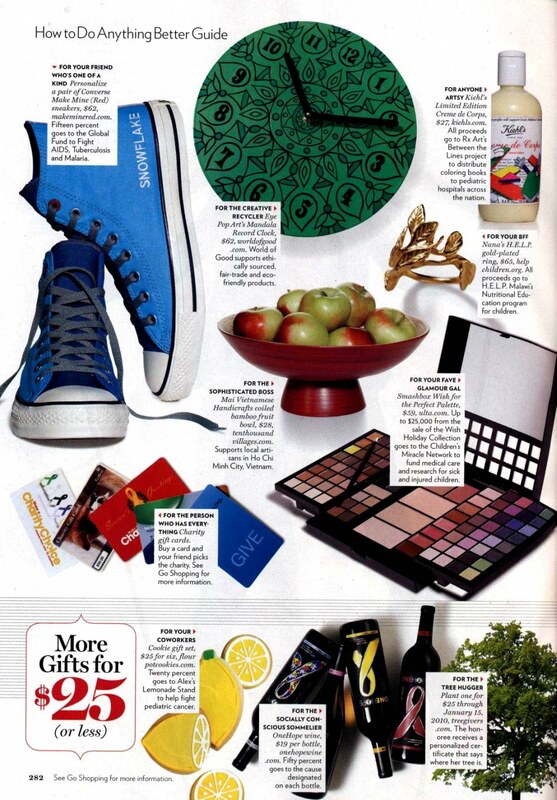 Many thanks to my friends at Buy Green for sending the clock to Glamour! Click here to find their listing for this item on WorldofGood.com. I'm pleased to announce that I'll be vending my Roman Record Cuffs at Junk to Funk this Saturday evening (November 14 - after the Trillium holiday sale!). I'm really excited just to get to be there to see the recycled fashion show. It's going to be really cool. If you're going, stop by my table and say hi! It's Trillium Artisans' 10th anniversary! Join us for our annual Holiday Sale and Open House. Shop for locally handmade, eco-friendly, fair trade gifts, made from recycled and reclaimed materials. Take 20% off your ENTIRE purchase during this event. Preview our items online on our website, on Etsy, or on World of Good by eBay. I'll be at the holiday sale this Saturday from 11 - 2, so come before 2 if you want to say hello to me - but it will be going on until 4, and everything is 20% off which is great! 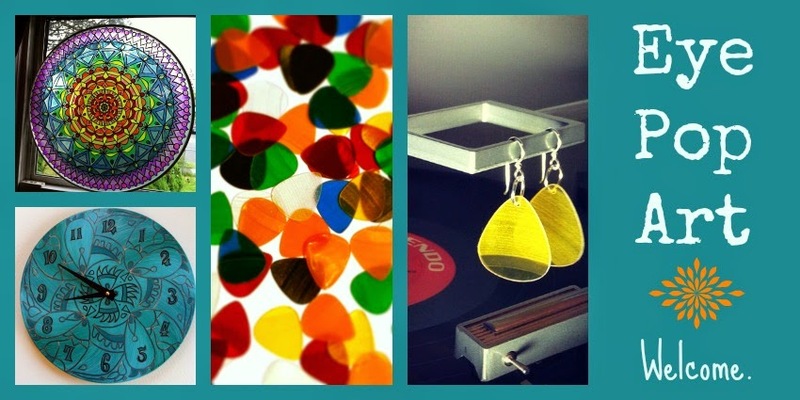 You'll find all kinds of beautiful work from more than 40 local artisans, including Eye Pop Art cuffs, clocks, mirrors, magnets, and suncatchers. I work at Trillium on Tuesdays and Fridays, and some Wednesdays. Come see me at the store some time! We've also just opened up a new Trillium Annex at SCRAP. I took a batch of merchandise over there yesterday and helped Bethany set up a little store in a designated area of SCRAP's big warehouse-like space. It looks really cute! My black cuffs and suncatchers can be found there, and I hope to add clocks, bowls, and other items soon. This tutorial was really popular last year about this time, so I thought I would repost it. It got like 4000 hits in one day or something crazy like that, thanks to stumbleupon. 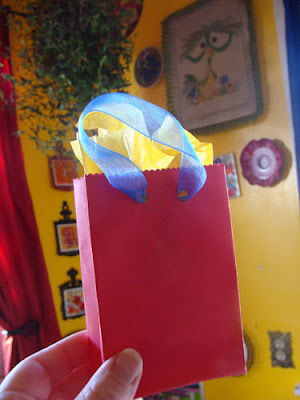 It was also posted on the Eco Etsy blog, and rikrak recently linked to it in the follow-up piece for her Etsy Virtual Labs workshop about holiday packaging. Enjoy! So you're thinking of Taking the Handmade Pledge and changing the way you buy gifts this year. Maybe instead of lots of big boxes from big box stores, you are going to invest in small but high quality, beautiful handmade items (for example, buying jewelry on Etsy for all your girlfriends). 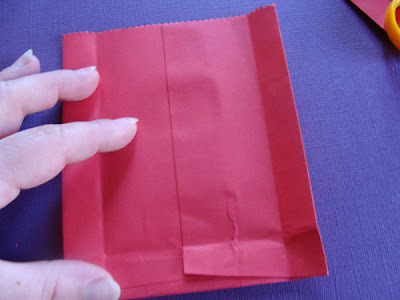 Here's a ridiculously easy way to make your own little gift bags if you're thinking you'd rather not go buy Made-in-China gift bags at the dollar store. 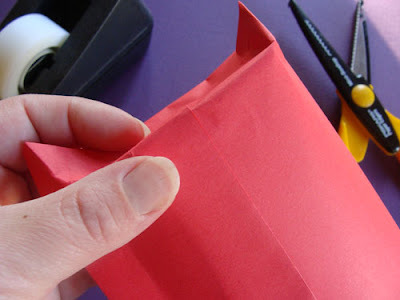 All you need is an envelope and a little creativity! 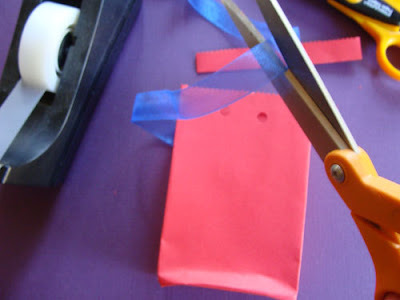 Here is what you need to make a cute little gift bag: an envelope (any size, any shape), some scissors (fancy ones that make scalloped edges are fun), a hole punch, some ribbon or yarn, and some stuff with which to decorate your bag. At Crafty Wonderland's DIY table we had lots of options - you could cut up old holiday cards and glue images onto your bag, draw on it with pencils or black Sharpies, color it with crayons, markers, glitter glue, or colored pencils, paint it with watercolors, or any combination of the above. I like how this allowed each person to really make a beautiful, personalized, individual piece of art. 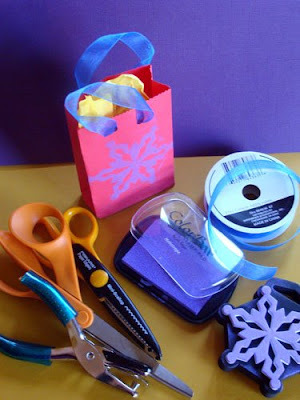 However, for the purpose of this tutorial, we will just be decorating it with a simple snowflake stamp. 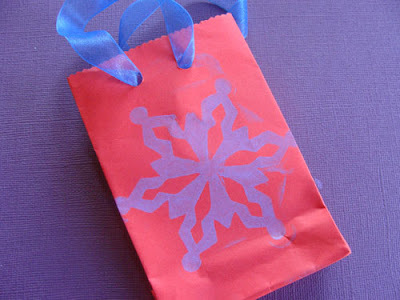 If you want to make a whole bunch of these, as I did for Trillium's holiday sale on Saturday, then you might want to simplify it by stamping them, depending on how much time you have and how personalized you want the bags to be. The sky's the limit! 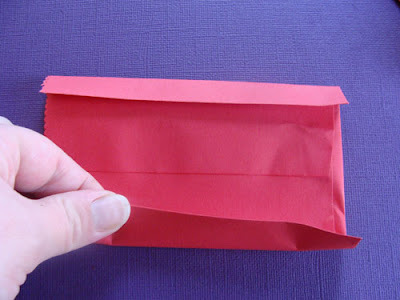 Okay - first, seal the envelope. Then, cut it. 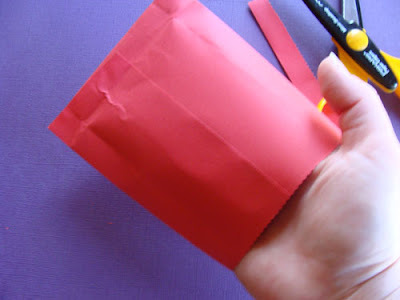 You can cut it in half to make two little bags, or cut it near one end to make a bigger bag. 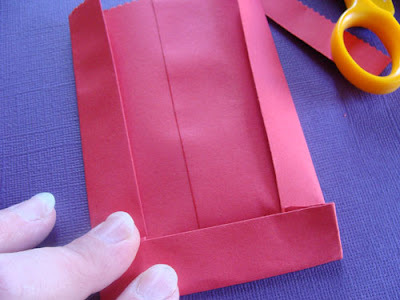 Next, fold one side over about a half inch and crease it well. 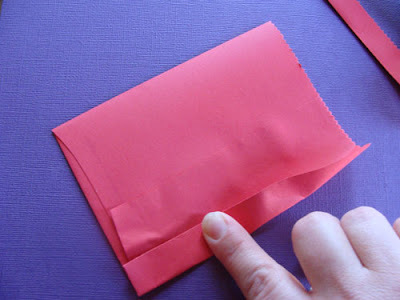 Fold the opposite side the same way. 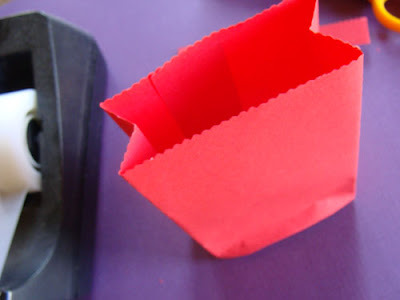 Fold up the bottom, creasing well. 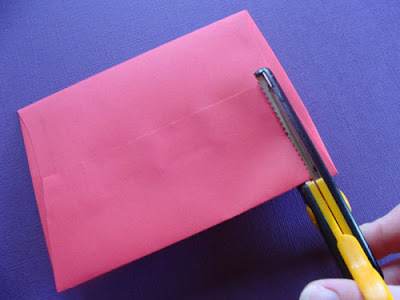 Stick your hand inside the opening. You are basically reversing all the folds to the inside. 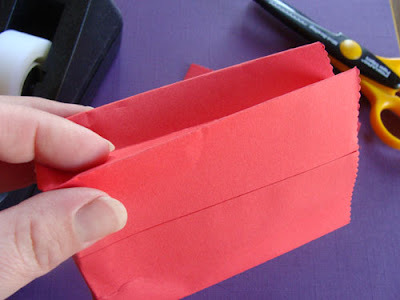 You will have two triangular flaps, which you can tape down if you want. 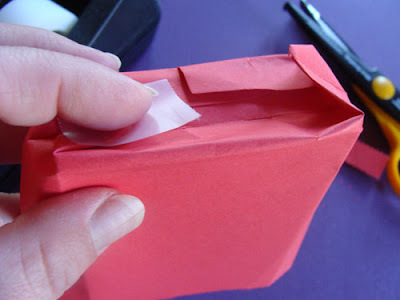 Continue reversing all the folds and re-creasing. 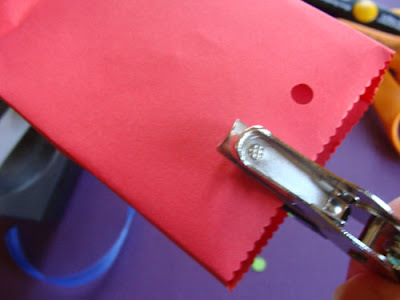 Now, you can add little handles to the bag. 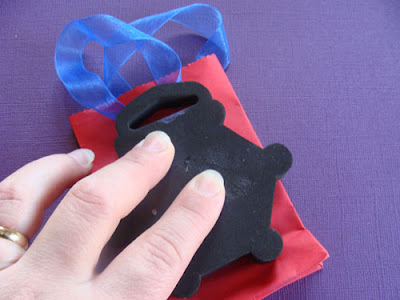 Punch two holes on each side of the bag. 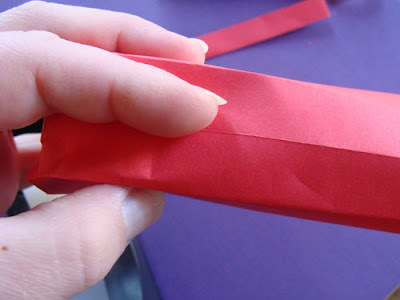 Cut two pieces of ribbon, both the same length. 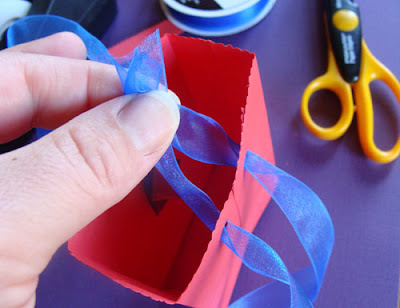 String your ribbon through and tie it on the inside. Voila! 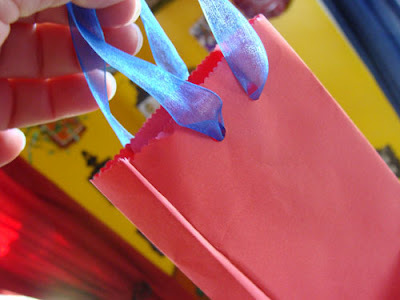 You have a cute little gift bag. You can leave it alone, or decorate it however you like. I used a stamp. 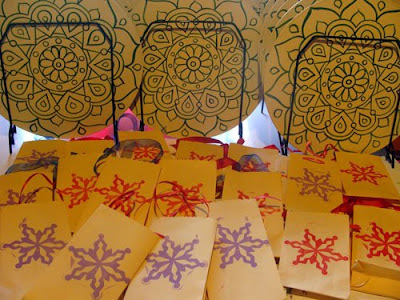 I made them out of manila envelopes because I have a ton of them. 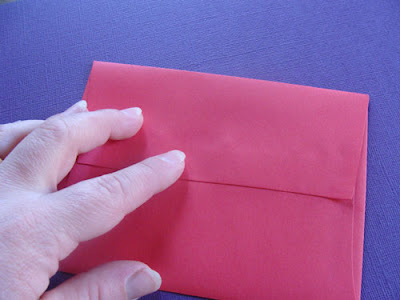 I think colored envelopes would have turned out much better so I would suggest using colored envelopes if you can. 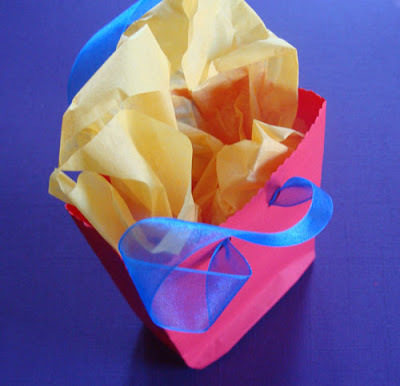 This project is not only great for gift-giving, but it would be a fun project at a kid's party, or a great solution for party favors.